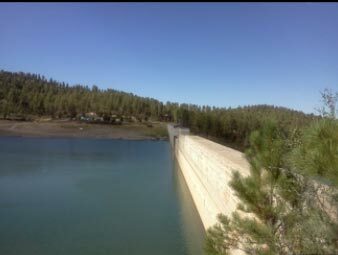 Grindstone Dam, located near Ruidoso, New Mexico, is a Roller Compacted Concrete (RCC) dam with a 2-foot thick conventional concrete facing. The facing concrete was constructed with architectural “rustication joints”. 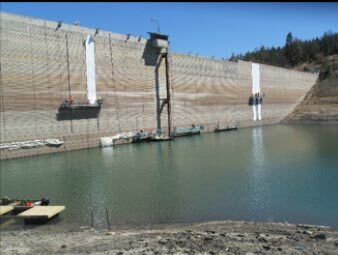 Full-height, vertical joints were placed every 16 feet along the dam length. Horizontal joints were placed 2′ on center near the lower dam and 1′ on center near the upper dam section. 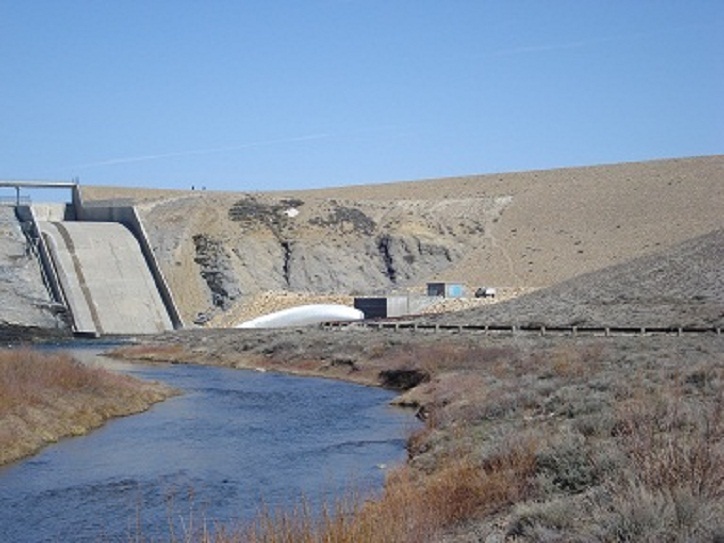 The dam is reportedly the first Roller Compacted Concrete dam constructed in New Mexico. Cracks formed in some rustication joints, likely due to thermal stresses on the concrete facing. This allowed water seepage into the dam. RCC consolidation voids were discovered during an investigation at the RCC to facing concrete boundary. This condition also allowed water seepage. After review, both the village and State Engineer office desired mitigation of the seepage. A proprietary liner was proposed by an international supply and contracting company. 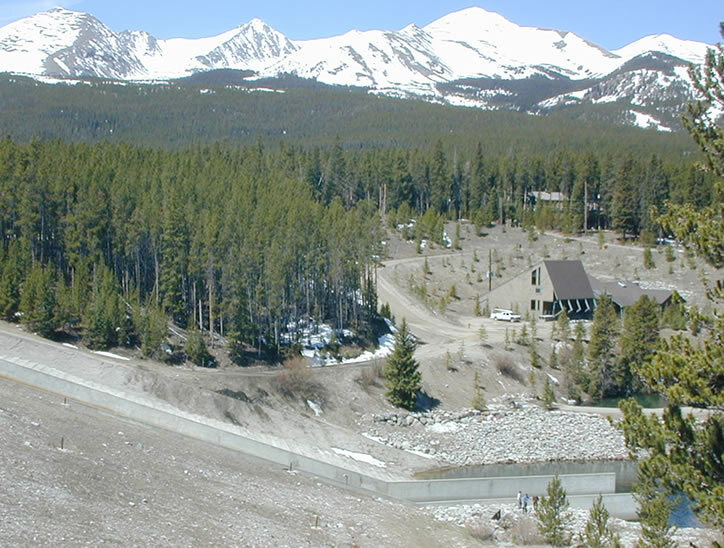 Termination of the liner, proposed at an elevation of 6860 feet was set above the dam foundation. This elevation was selected to prevent complete drainage of the impounded lake. However, due to the rustication joint cracks and poor RCC consolidation, an effective liner termination could not be installed. 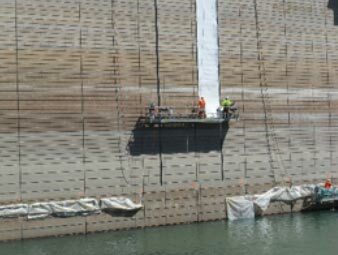 Water would enter cracks, continuous below the liner, and enter the dam behind the liner. Restruction Corporation was consulted and hired by the lining contractor to construct a solution that created a complete liner termination point. Curtain grouting through the concrete face to fill voids using urethane grout was chosen. Holes drilled at 12″ on center along the termination point were injected with a hydrophobic urethane multi-grout. Urethane has a controlled chemical reaction time, allowing for installation of a waterproof “band” between the facing concrete and RCC boundary. This band would stop water from entering the cracks below the termination point and, under water head pressure, be pushed up behind the liner. Interested in a Career at Restruction? Restruction Corp. is an Equal Opportunity Employer.